+ Cryptographic protocols used in wireless networks. + Various types of wireless network attacks, including reflection, session hijacks, and Fluhrer-Mantin-Shamir (FMS) attacks. + Encryption/decryption standards and methods. + Secure sockets layer (SSL) and transport layer security (TLS) protocols. + Cellular telephone network architectures and their vulnerabilities. And you'll also find coverage on such cutting-edge topics as security techniques for ad hoc networks and protecting Bluetooth networks. 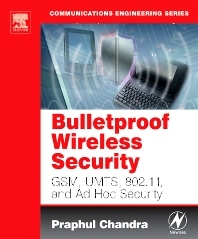 If you're serious about wireless security, then this title belongs on your reference bookshelf!